-It uses 35mm film which is easier to find than the film normal Dianas use. -It is more compact and easier to carry around. -It was a lot cheaper than the other film cameras I was researching. I can't wait to try it out and let you all know about how I get on. Expect many more posts about film cameras! I took this sneaky shot with my digital camera and I thought it was great because it captured a little peice of my life. 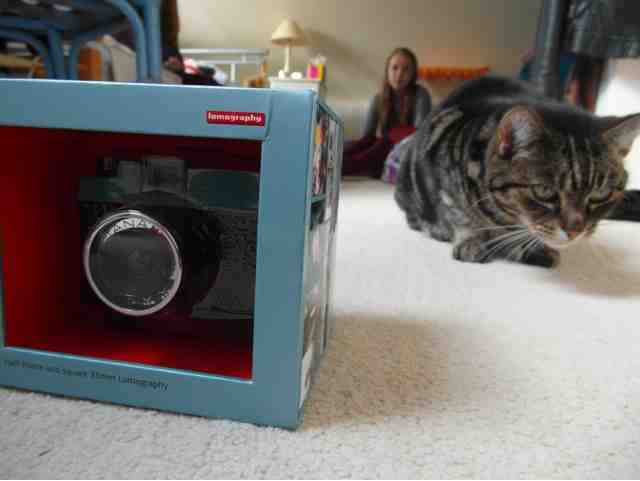 My cat, my Diana mini and my friend Rosa in the back.